What a difference a day makes. Scientists estimate that every 24 hours, 150 to 200 species of plant, insect, bird and mammal become extinct. Though extinction is a natural occurrence, it is now happening at nearly 1,000 times the natural or "background" rate. Many biologists say the phenomenon exceeds anything the world has experienced since the dinosaurs vanished. The United Nations Environment Programme, which sets a global environmental agenda, states that the Earth is experiencing a mass extinction of life. Ten artists address this alarming issue visually in "On the Brink: Artists Take Action," an exhibition of 14 paintings at the Gallery at Central Vermont Medical Center in Berlin. Some of the artists are scientists by profession, others use their artistic skills in related scientific fields, and all of them capture nature as a subject worthy of lifelong study. This is fine art on a mission. 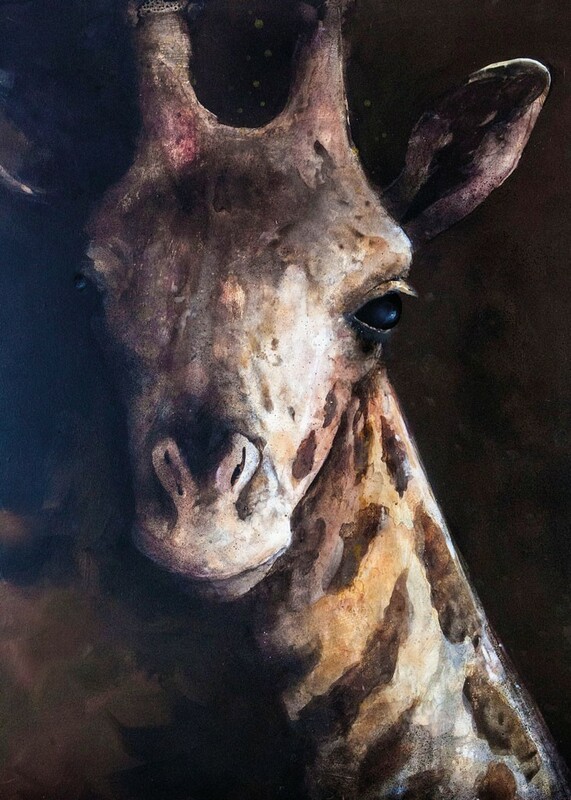 Plainfield artist Adelaide Murphy Tyrol's two paintings on exhibit illustrate her ability to evoke the interior life of the animals she paints. Tyrol's 30-by-40-inch "Giraffe" is an acrylic-on-wood portrait of the animal's head and shoulders. The dark background and the light falling across its face render an exquisite picture of the Nubian giraffe. Tyrol's technique emphasizes its majesty while also placing it on a backdrop that suggests solitude. In December 2016, the International Union for Conservation of Nature placed the Nubian giraffe on its Red List of Threatened Species. 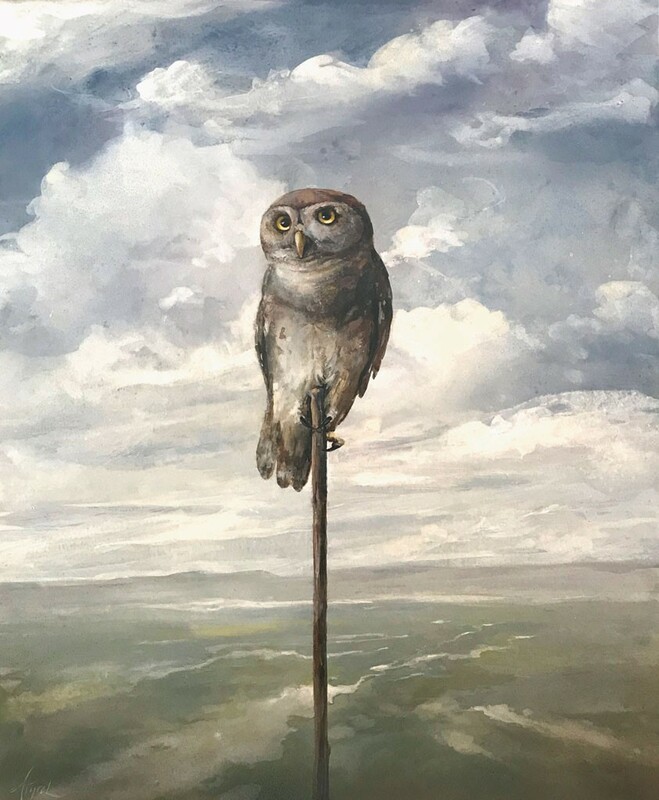 Visitors entering CVMC through its main entrance will be greeted by Tyrol's painting "Forest Owlet," in which the subject perches on a tall dead tree or stand in a conservation area. Behind it loom a cloud-filled sky and a vast landscape, as if infinity were a place. Again, Tyrol depicts the owlet alone, suggesting a diminishing species. This tiny, critically endangered diurnal owlet, found in central India, exhibits a keen sense of itself and its surroundings in Tyrol's compelling 20-by-24-inch acrylic on wood. Vermont galleries are filled with depictions of wildlife, most of it intimately familiar to us from the backyards and backwoods of New England. Here, by contrast, paintings of a Hawksbill sea turtle, a black-footed ferret, the forest owlet, an eastern mountain gorilla and other creatures offer glimpses into equatorial Africa, the American prairie, tropical oceans, the forests of India and other regions. Not only do the artists depict a stunning diversity of wildlife on the brink of extinction, but they engage viewers in the wild beauty around the globe, calling us to a reckoning with the planetwide crisis. 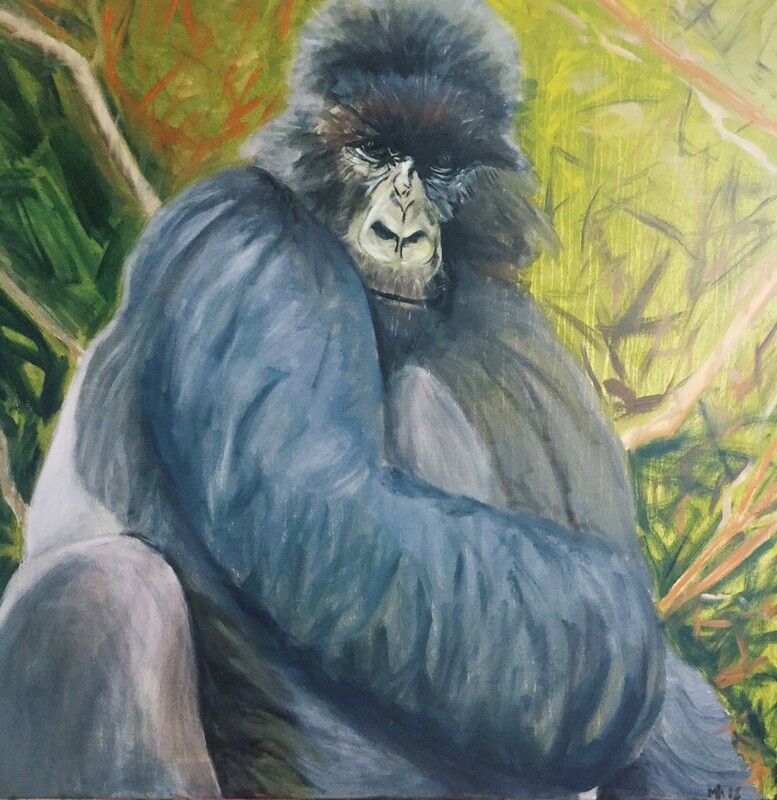 East Randolph artist Marcia Hammond takes on a challenge in her revelatory 40-inch-square oil painting "Eastern Mountain Gorilla." Most viewers will recognize the creature, partly owing to American primatologist and conservationist Dian Fossey's work with mountain gorillas in the Congo and partly to the fact that gorillas (family Hominidae) are among the closest living relatives of humans. Here, Hammond presents the gorilla seated and turned, looking directly at the viewer. He appears in his natural habitat, prey to few — save humans who hunt gorillas for meat — but threatened by diseases such as the Ebola virus and destruction of his habitat by mining and agriculture. Hammond's gorilla seems powerful. Yet her brushstrokes and handling of color, as well as her choice to portray him in a seated position, amplify the human connection and invite us to feel a strong affinity for him. Lark Upson, who lived and worked in Marshfield for many years but now lives in France, turned to painting after 20 years as a furniture maker and architectural and interior designer. She eventually began painting full time, moving from portraits of people to those of animals. Upson's art expresses her passion for raising awareness of the ongoing extinction of wildlife. Last year, her exhibit at the Vermont Supreme Court Gallery included four of her endangered-animal portraits. There, she appealed to other artists to join her in highlighting the animals' plight, a call to action that inspired "On the Brink." Upson's large-scale paintings max out the exhibit space at CVMC. Two of her canvases are hung unframed, conveying a sense of rawness that the portraits themselves exude. 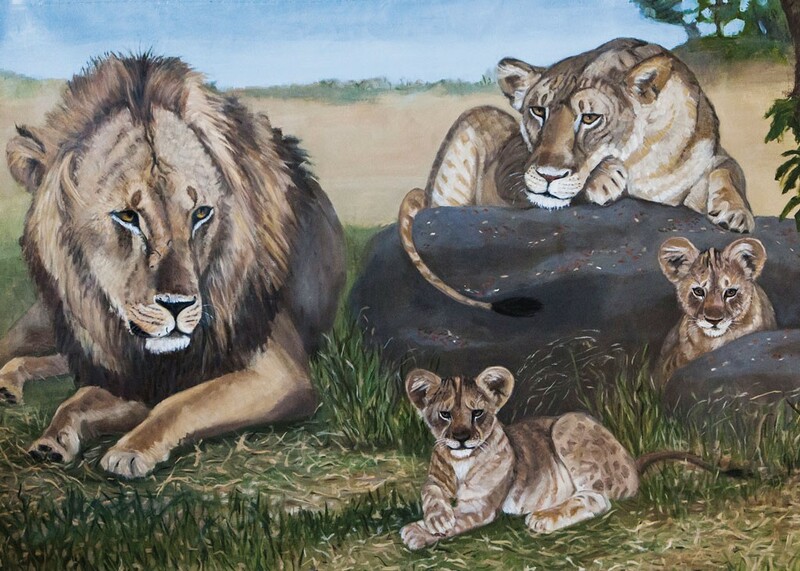 "African Lion," her 45-by-60-inch oil on canvas, shows a male and female lion with their two cubs. It's something of a family portrait, with an extensive habitat evident behind them. The presence of the offspring lends the pair vulnerability. Upson's other painting, "Polar Bears," dominates a gallery wall — not surprising, since this species is the world's largest land predator. The scale of Upson's work underscores that size is no guarantee of safety. Polar bears are increasingly vulnerable to the effects of climate change, which has diminished their habitat, bringing them closer to industrial development and into conflict with humans. Berlin-based artist Linda Mirabile works with environmentally focused organizations in her art and graphic design work. She is an astute observer of avian life, as exhibited in her 60-by-30-inch "Siberian Crane" in acrylic on wood. A black background thrusts the crane into prominence. 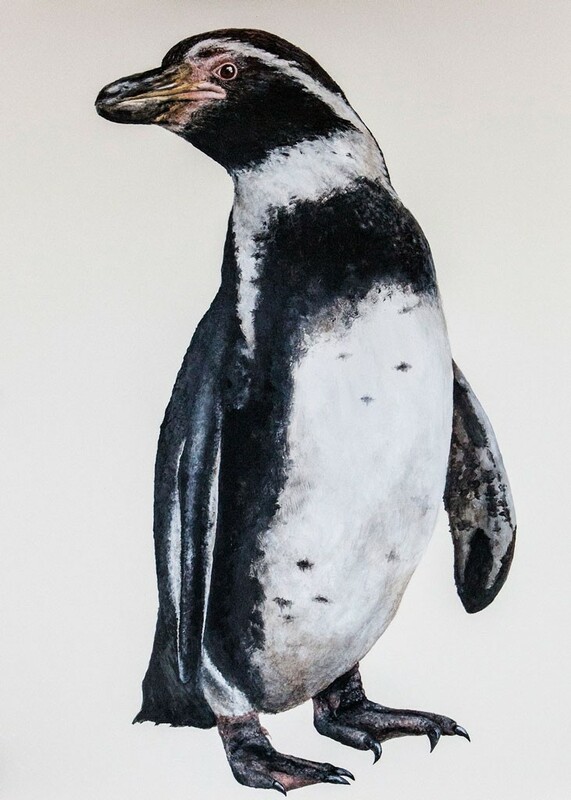 Mirabile includes extraordinary details, from the feathered "hood" framing its face to its non-webbed feet and elongated toes and nails as it stands in low water. These details make for an accurate depiction and a compelling narrative of birds and habitat. 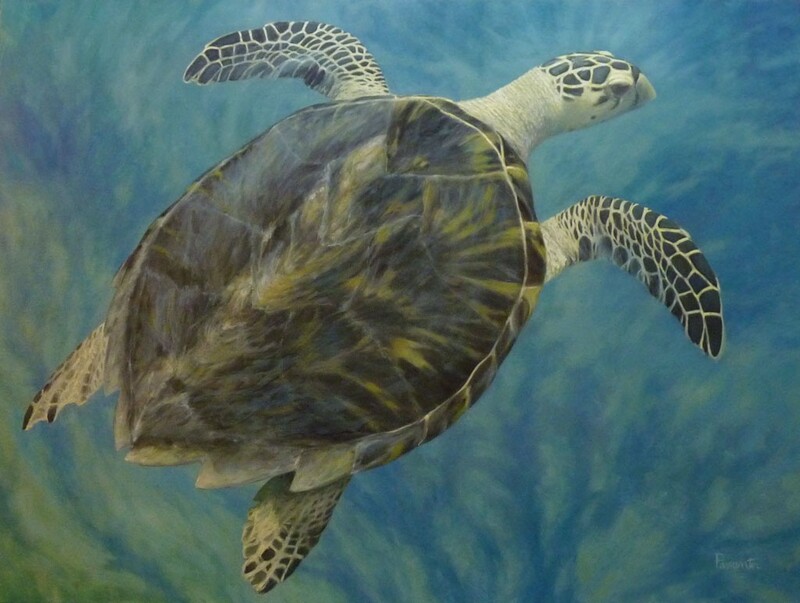 All of the works on exhibit are two-dimensional paintings, but Susan Parmenter of Sunapee, N.H., comes close to 3D with her 30-inch-square oil on canvas, "Hawksbill Sea Turtle." Seen from a slight distance, the blue sea appears to lift and support the turtle as it traverses tropical waters. Parmenter's other two works are equally compelling, especially "Black-Footed Ferret." The ferret keeps watch above its hole in a grassy western prairie; in the background, the sun sinks behind distant storm clouds. Suzanne Stryk has hit a special note with her 12-by-9-inch mixed media on paper, "Chucky Madtom." In her delicate rendering, partially obscured handwriting — scientific research notes? — and sepia-like watercolor surround the elusive freshwater fish, which has been observed in Tennessee. Stryk has given the small and virtually unknown madtom a narrative of complexity and caring. These wildlife may be on the brink of extinction, but the artists seem to be just getting started. The original print version of this article was headlined "Painting by the Numbers"